FLC will be coordinating with Sidley Austin LLP to facilitate the provision of pro bono legal services in the area of small-scale fisheries (SSFs) in Africa and Asia. Beneficiaries will receive advice on issues ranging from establishing new seafood plants or developing new cooperatives or corporations to financing, intellectual property, and international trade matters. For more information, please click here. On April 11th, the lawyers representing Sea Shepherd will be speaking at the University of British Columbia at FLC’s invitation, in Room 120 of the Fisheries Centre (2202 Main Mall, Vancouver, B.C.). Captain Paul Watson will also be joining us for a discussion via Skype. For more information, click here. FLC and Legal Atlas have agreed to share past and future legal research to populate the Fisheries Law section of Legal Atlas’s global legal database, and to co-author related materials and publications. Legal Atlas was incubated at the University of Montana in 2011, and aims to allow users to access, compare, and research laws on a variety of topics in various jurisdictions. FLC Director Adam Soliman will be teaching at the Law School of Dalian Maritime University in China’s Liao Ning Province from April 14-18, 2014. In collaboration with Hong Kong University, FLC has organized a special session on food law at the 1st International Conference on Food Safety, to be held at the School of Biological Sciences from June 16-18, 2014. The special session will take place on June 18 and will update attendees on the latest developments in food safety regulations. It will also offer an opportunity for exploration of pertinent questions. Click here for more information. FLC and Ecotrust Canada, a nonprofit working at the intersection of conservation and the economy, are offering four unpaid fisheries internships this summer on the following topics: Electronic Monitoring and Intellectual Property; ITQs, Ownership Access, and Privatization; Legal Constraints of Alternative Fisheries Governance Models; and Social Finance in Fisheries. Further information can be found here. 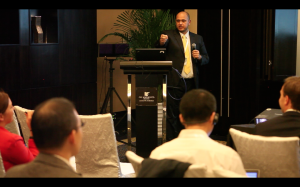 In December 2013, FLC Director Adam Soliman delivered a presentation at the International Conference on Fisheries Governance in India in collaboration with Too Big To Ignore. The presentation was titled Community Based Fisheries Management Schemes (CBFM) in the U.S and Canada: Constitutional Challenges. Adam examined two schemes: Community Quota Entities (CQE) In Alaska and the Aboriginal Fishing Strategy in Canada. Adam emphasized the need for a constitutional and legal foundation that adequately supports CBFM. Adam also assesses the degree to which CBFMs have achieved their objective of making small-scale fisheries more resilient and whether CQE related instruments are constitutional in India, Canada, US and South Africa. FLC would like to acknowledge Too Big To Ignore for its financial support. The Fisheries Law Centre offered continuing legal education (CLE) programs in seafood regulations. There is an increasing need to develop comprehensive systems of regulation to ensure food safety in seafood sectors and sustainable management of marine ecosystems. Therefore, FLC has spearheaded initiatives to offer CLE courses that focus on fisheries law and marine governance that help to sustainably manage depleting wild habitat and resources in the world’s oceans. To view next course offerings and location, click here. Adam Soliman gave a seminar as a part of “Earth Law Talk” at the UBC Law Faculty this past November where he shared insights from his paper, Does Private Property Rights Promote Sustainability? Examining Individual Transferable Quotas in Fisheries. Adam’s seminar discussed whether private property rights in fisheries promote sustainability? Adam argued that existent fisheries management infrastructures need to change in order to lower current levels of degradation and harness ecological stewardship in the seafood and fishing industries. Adam’s seminar also examine catch shares management regimes, such as individual transferable quotas used to regulate fisheries. Adam argued that despite some success of catch shares, property rights provided by ITQs are not sufficient in guaranteeing resource sustainability. Furthermore, Adam discussed alternative community based management schemes, which could offer stakeholders incentives to cultivate sustainability and longevity in global fisheries. On behalf of the FLC, Director Adam Soliman was invited to deliver a presentation on seafood fraud at the Food and Drug Law Institute’s annual conference in Beijing. Overfishing depletes ocean ecocsystems, as more than three-quarters of global fish stocks are fully or over exploited. This is what brought on the rise of seafood fraud, which is a practice of misleading consumers about what seafood they are buying, in order to increase profits. On top of overcharging consumers, seafood fraud negatively impacts marine conservation efforts. This is because many seafood companies mislabel their seafood to hide the fact that they are selling threatened or endangered species, such as Bluefin tuna and various other species. Hence, Adam’s presentation addressed regulatory efforts that can be employed by the Chinese government to address this issue. On behalf of FLC, Adam Soliman visited Dalian Maritime University (DMU) in China. It was a successful visit where FLC and DMU are now discussing entering into a memorandum of understanding for facilitating academic and research cooperation. Furthermore, Adam will be teaching fisheries law courses at the law faculty of DMU in sprig of 2014. The fisheries law curriculum will equip law students to anticipate and address looming problems in the decline of global fish stocks and fish fraud in Asia. Shaping legislation to regulate fisheries is crucial for restoring global fish stocks, controlling seafood fraud and conserving marine ecology. Governmental efforts to improve the state of the world’s oceans begin in law faculties, that’s why this academic and research collaboration is very exciting. 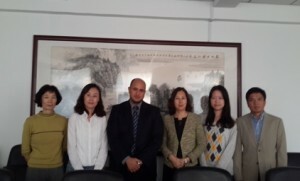 Above: Picture of Adam Soliman with Prof. WANG Xiufen, Ms. YU Shihui, Prof. HAN Lixin, Ms. LI Zhen and Prof. WANG Shitao. Seen below, Adam Soliman is giving a presentation on fisheries stewardship and access to justice at the BFAR-NFRDI Conference in Manila. He presented key ideas from his paper, Duty of Stewardship and Fisheries Governance: A Proposed Framework that call on stakeholders of the seafood industry to adopt marine stewardship as a duty. The concept of stewardship is exemplified by the public trust doctrine which states, the government is responsible for submerged land under navigable waters in trust for the benefit of the public. This is because natural resources of the world’s oceans belong to the general public. Therefore, the use of the resource must factor in the public interest. To that end, Adam argues that a legal duty of stewardship, if recognized, would offer an alternative to private proprietary rights management tools. Adam’s presentation also suggested potential partnership with NFRDI in signing a memorandum of understanding with FLC that encompass a student exchange for GSIP projects as well as potential collaborative efforts in research and scholarly cooperation projects on fisheries law in the Philippines. 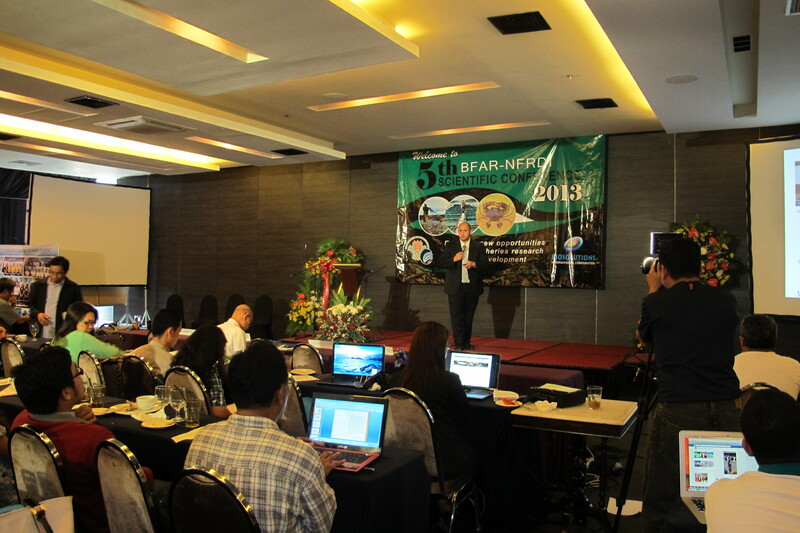 Seen below, Director Adam Soliman is giving a presentation on fisheries stewardship and access to justice at the BFAR-NFRDI Conference in Manila. 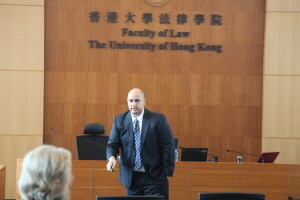 Adam Soliman has close ties with the law faculty of HKU and he recently offered a seminar on seafood fraud. Hong Kong and China has a significant role and interest in resolving this growing fraudulent practice. This is because China is the world’s largest consumer, importer, exporter and producer of seafood and Hong Kong is the world’s most important hub where a significant amount of seafood is traded. Mislabelling of seafood raises economic and health concerns for consumers. This seminar discussed labelling requirements, certification schemes, traceability regulations, and Port State Measures. It also highlighted recent initiatives in HK to impose regulatory import controls on aquatic products and regulations governing import/export data reporting. The Fisheries Law Centre was at the World Seafood Congress in collaboration with “Too Big To Ignore”, in St. Johns Newfoundland. Adam Soliman represented FLC on the panel to discuss Voluntary Guidelines for Securing Sustainable Small-scale Fisheries in the Context of Food Security and Poverty Eradication developed by the Food and Agriculture Organization of the United Nations (FAO). Human dignity, respect of cultures, non-discrimination, equality, meaningful consultation, enforcing the rule of law, transparency, and accountability are among the rights recognized by the guidelines. Adam addressed the gap in access to justice in small-scale fisheries discussing its educational, research and advocacy dimensions. In September 2013, Adam delivered a seminar tiled, Environmental Stewardship Beyond Morality, Ethics, and Principles which deliberated the duty of marine stewardship. Adam presented his research paper that proposes to assign a legal duty to marine stewardship to fishers and stakeholders. The concept of stewardship is justified by several principles recommended for fisheries governance, which include environmental ethics, sustainability, food security, precautionary regulation, and inclusiveness. Adam argued that assigning a duty of stewardship to the resource user may promote responsible behavior. The Seminar was at the Fisheries Centre at the University of British Columbia. © FishLaw.org all rights reserved.